Squirrels are harmless small rodents living in wooden areas, and sometimes in the trees of your yard. They are cute, of course, but they are very destructive once they invade your home. They set up their nests in your house walls or attic, and they can chew their way in. Not to mention that they can chew the electric wires causing house fires. So, you have to keep them away from your house. But, remember one thing: when you see a squirrel you should know that is more scared of you than you are of it, so stop yelling! First of all you have to identify where the squirrel is then use some humane tricks to get rid of it! 1. The best way in getting rid of squirrels is to close all doors of the room where the squirrel is and open the windows that lead outside. Leave the room, and the squirrel will find its way out. 2. The blanket trap. Take a blanket and hold it in front of you, and slowly get near the squirrel and quickly throw the blanket on it. Catch it, but not too tight so as not to hurt the little rodent. Take the blanket and throw the squirrel outside. 3. Remember that squirrels are afraid of noise and strong light. You can use this trick if you have a squirrel in your attic. Put some music on, advisable some sounds with dog barks, take a strong light flashlight and leave. The squirrel will find its way out and leave. 4. Also you can use some home repellent such as cayenne pepper by sprinkling it around the access areas. Or dip some cloths in ammonia and put them from place to place. 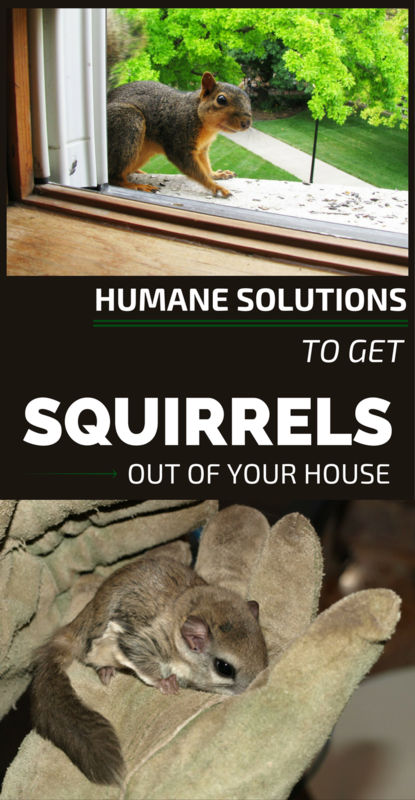 Squirrels hate the ammonia smell and they will keep away from your house.